A BMW official shows off the all-electric i3 linked to a Samsung Galaxy Gear smartwatch at CES 2014. 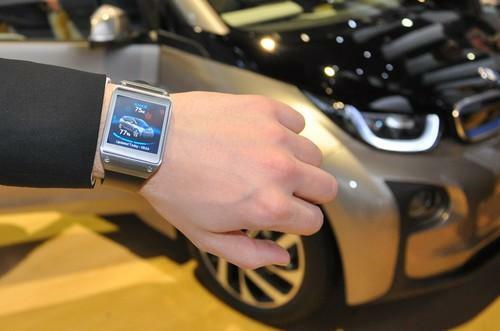 The watch can command the i3 to sound its horn and display info such as charge remaining in the battery. The crime-fighting hero of the classic 1980s TV show "Knight Rider" and his artificially intelligent sidekick car, KITT, inspired a generation of kids to look forward to a future where smart vehicles are an extension of their drivers. At the International CES expo, exhibitors are showing a range of technologies that are bringing that dream closer. Mobile device connections, active safety features and autonomous driving are turning cars into your own "personal robot," as Nvidia CEO Jen-Hsun Huang describes it. "The car will be your most important personal computer," he told reporters at Nvidia's press conference on Sunday. The company wants its upcoming 192-core Tegra K1 graphics chip to be used for HD video playback and 3D gaming for passengers, as well as for driver assistance programs such as collision avoidance. Along with GM, Honda and other carmakers, Nvidia is part of Google's Open Automotive Alliance (OAA), announced Monday, that will bring the Android platform to cars in 2014 in a standardized infotainment ecosystem. Audi, another OAA member, showed off the second generation of its zFAS car "brain," a tablet-sized piece of hardware that piloted an A7 sedan onto the stage during an Audi keynote presentation. The device was also parking Audis all by itself outside the Las Vegas convention center. When viewed through rose-tinted spectacles, all the zFAS needs is a prissy accent and a turbo boost, and you'd have your own personal KITT. Car enthusiasts at CES who are looking forward to super-intelligent, self-driving cars want to know when they'll be able to fall asleep at the wheel while "driving" to work. "There will be no big bang to get an autonomously driving car," said Elmar Frickenstein, executive vice president of Electrics/Electronics and Driving Experience Environment at BMW. "That's my personal belief, because it goes step by step. In the past, we didn't have ABS brakes or dynamic stability controls. Today we have all these things." The most important step for BMW is high-resolution map data, Frickenstein said after speaking at a panel on how technology is changing driving. "Then, we can drive autonomously on the road." Autonomous cars have been under development to some degree for decades but gained a major impetus with the Defense Advanced Research Projects Agency (DARPA) Grand Challenge of 2005, a 212-kilometer (131-mile) off-road race in California and Nevada that was won by a modified Volkswagen Touareg from Stanford University in just under seven hours. Since then, production cars have been getting autonomous features such as driver assist, but cars at CES were taking the next step. "This year at CES we're seeing practical applications of autonomy, and we're starting to see consumers getting more accustomed to that under the guise of safety," said Jon Rettinger, president and editorial director of TechnoBuffalo, who chaired the panel on future driving. Just outside the convention center, France's Induct Technology was demonstrating its just-launched Navia, a US$250,000 self-driving shuttle designed to ferry people around university campuses, airports and other zones with limited traffic. The company calls it the world's first self-driving commercially available vehicle. The Las Vegas Monorail zipped by overhead, of course, but it uses a purpose-built track. "We use mainly SLAM (simultaneous location and mapping) lasers to map and detect obstacles," Induct marketing and communications director Max Lefevre said as he ushered me into the all-electric shuttle. Soon it was silently transporting us around a test track. "The lasers see up to 200 yards, and the vehicle knows to either slow down or stop if there's an obstacle." Some Induct customers will have a Navia fleet this year, Lefevre said, but he wouldn't identify them. The shuttle has been extensively tested in areas full of pedestrians, he said, adding that legislative changes are needed for wider deployment. Large automakers are working with the U.S. National Highway Traffic Safety Administration (NHTSA) to make cars more aware of their environment by using vehicle to vehicle (V2V) communications. Not far from the Navia test track, Ford showed off a Taurus SHO sedan equipped with this protocol, which wirelessly shares vehicle speed, heading and GPS data with nearby cars, in a series of safety demos. I sat in the rear seat as the Taurus hurtled toward an intersection while another Ford vehicle to the right approached at speed from behind cars blocking the view. In what seemed like a second or two before impact, the Taurus alerted its driver to stop with flashing LEDs projected on the windshield, a sound alarm and vibrations in the seats. He then slammed on the brakes. The NHTSA has been evaluating V2V tests and is expected to announce a policy for bringing it to commercial implementation in a few weeks, according to Farid Ahmed-Zaid, a technical expert in Ford's Active Safety Department. While the technology could reduce fatal collisions dramatically, Ahmed-Zaid admitted that, "If GPS fails, then you don't have anything." Some industry observers are concerned that making cars smarter, more aware and more independent could erode driver skills. That could become an inevitable effect of automobile evolution, just as fewer people today can operate a manual transmission than in motoring's early days. But one thing that many car owners won't miss is drudgery driving, especially parking. Audi, Bosch and Valeo demonstrated vehicles at CES that can parallel-park or backup-park themselves with just a swipe of an iPhone when the driver is away from the car. Driving to a shopping mall, getting out and then having your car park itself -- a kind of automatic valet function -- is an extension of assisted parking that would require regulatory changes to become widespread. There is also concern that loading smart cars with even more navigation features, cloud-linked data services and social media functions will only increase distracted driving. But those features are also seen as desirable, because as cars drive themselves more, drivers will need to be entertained. Android apps in the new OAA alliance will soon be competing with apps under the iOS in the Car standard announced by Apple last summer. BMW's i3 electric production car, available in the second quarter 2014 with a list price starting at $41,350, can already link with driver smartphones via the BMW i Remote app, sharing info on battery charge, whether doors are open or closed and other vehicle features. In a spin on this, still at the concept stage, BMW and Samsung showed how the phone maker's Galaxy Gear smartwatch can link to the i3 and display information on drivers' wrists, allowing them to command the car's horn to sound if they've lost their i3 in a large parking lot. If CES 2014 is anything to judge by, cars are getting increasingly connected to drivers and increasingly autonomous. This new relationship between car and driver evokes many science-fiction scenarios, but if you ask automotive insiders when the future of completely self-driving cars will arrive, don't hold your breath. BMW's Frickenstein answered that with a laugh. "Ask me in 10 years," he said.